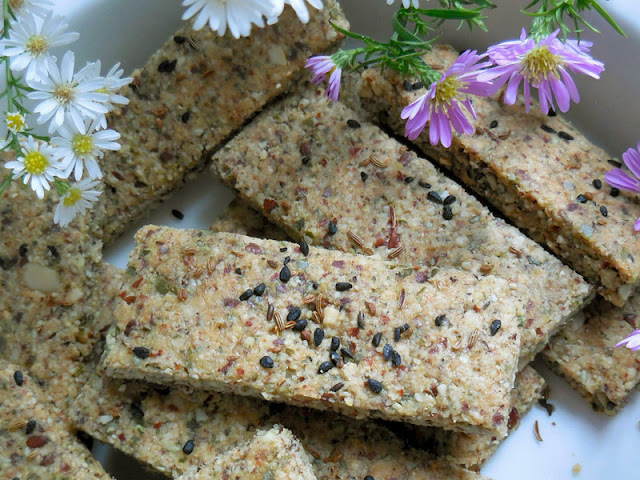 Simple, easy to make and full of protein, these bars are a great savory snack. We've tried them with a variety of nuts and seeds, with good results each time so feel free to experiment with your own variations. For this recipe we used a favorite combination, a mix of brazilian nuts, cashew nuts, almonds and pumpin seeds. Start by preheating the oven to 180°C. Line a parchment paper on a tray and set aside. Blend nuts into flour. Transfer to a bowl and add the salt. Blend the flaxseeds with the water to form a thick paste. Add to the bowl and mix well to form a dough. It should come together nicely in one ball. If it feels crumbly add one more tablespoon of water. Spread the dough to the tray and roll it out with a rolling pin. To avoid the dough sticking to the pin, try covering the dough with a parchment paper and roll on top. With a knife, cut into bars or any shape you wish. Spray some water and sprinkle with black cumin and ajwain seeds. Bake until slightly brown. Note: Ajwain seeds have great digestion proprieties. The active enzymes in ajwain help in boosting our digestive functions by facilitating the release of gastric juices. Ιf hard to find you may substitute with aniseeds with similar proprieties. Tip 1: For a lighter version of the bars you may soak them the night before to neutralize the enzyme inhibitors allowing for better digestion. In this case you won’t need to form a separate flaxseed paste to bind; you only need to soak the flaxseeds overnight together with the nuts. 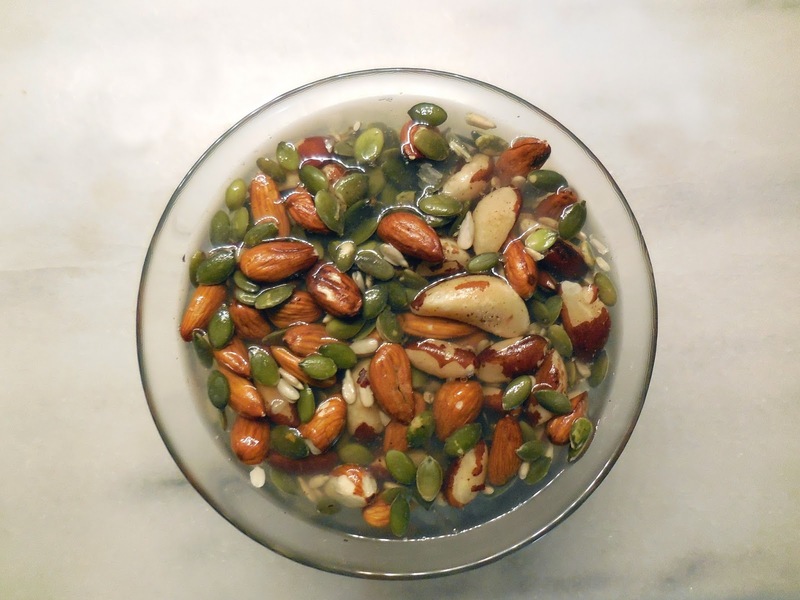 The next day you put the soaked nuts and seeds in a strainer and let them seat for ten minutes to allow them to strain well. Then follow next steps as per recipe. 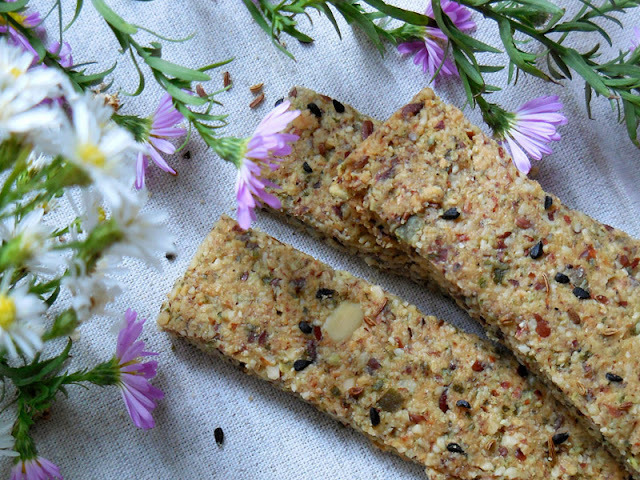 Tip 2: For an extra healthy snack these bars are excellent to dehydrate instead of baking. If you have a dehydrator it’s worth it. This way you get all the good fat oils of the nuts.